Growing up I hated wool. I Associated wool with over sized socks my mom would make around Christmas and itchy blankets on my Grandmother's guest beds. Recently, my younger brother Tim turned me onto a shop in downtown Portland (Oregon) called Icebreaker. All of their products are made of pure New Zealand Merino wool. Although their designs are very "sporty," appealing primarily for granola eating trail runners, some gems are available on their website. 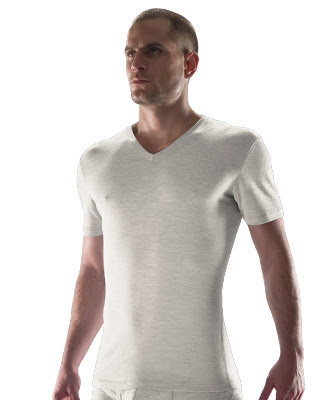 I personally own two V-Neck T-Shirts, in charcoal and white and a pair of Boxer Briefs, both pictured below. Merino Wool is an awesome material with all the comfort of cotton and the advantages of wool. Look for more designers to use this fabric.